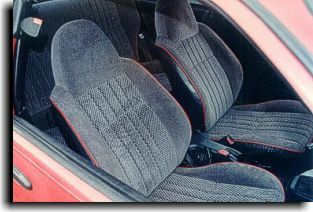 This is an example of taking a common type car and refreshing the seats with new upholstery. 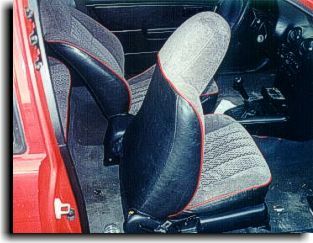 These Toyota seats was rebuilt using a combination of two different cloths on the facing of the seats so that when the customer is settled in the seats the comfort of cloth will be enjoyed. 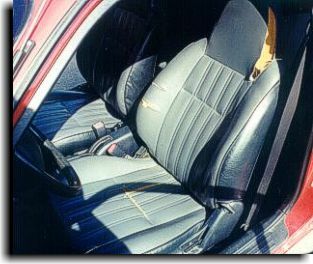 The seat is trimmed in a black vinyl using a red bead accent bringing the outside color inside the automobile. 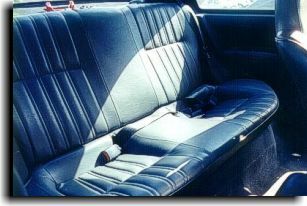 This is the original front seats showing the damaged condition and original vinyl material, sewing design and color used for design. Below is the finished, reupholstered front and rear seats. A nice velour in two different designs were used for the "facing" of the seats - the part that one comes in contact with when sitting in the seat. 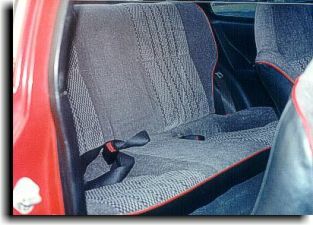 A more patterned cloth was used in the center of the seats for accent and a plain cloth was used to outline the center. 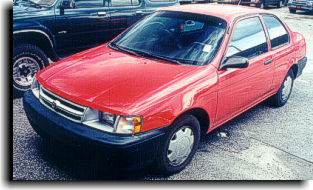 A red bead or welting was used for a color accent to bring a touch of the color of the car to the inside. Then a black vinyl was used to "trim" the seats out.